There were still a few things that we wanted to get supplies wise whilst we were in Nottingham. Firstly our new wine cellar was looking very empty, so needed stocking up. 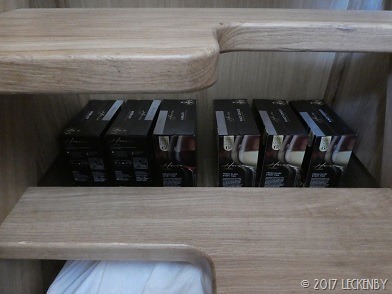 Finesse must have known that we tend to buy six boxes of wine at a time as there is the right amount of space under the back steps. Then Mick walked up into the city centre to Whittards to stock up on my morning brew, Afternoon Tea. On his way back he popped into Ultimate Outdoors in the next retail park to see what they might have in the way of 20 litre plastic containers. As Finesse have called it our Yellow water tank (wee) is 20 litres and under the bathroom floor. There is a gulper pump to empty this through what looks like a standard pump out fitting. We have an attachment that fits to this with a length of hose on it. 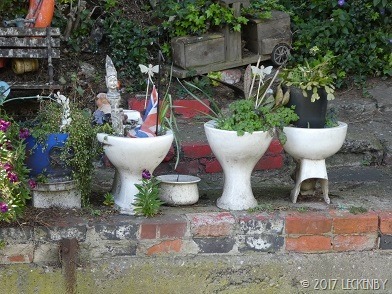 So far we have been lucky on our moorings as to where we could empty our Yellow water tank, but not all moorings will have a handy hedge to water! The pump certainly kicks out our yellow water with force so a suitable container to contain it was needed. Ultimate Outdoors came up trumps with a 23 litre black water tank. The only downside is that it would be handy to be able to see how much we produce over a couple of days so that we can gauge when it will need emptying. 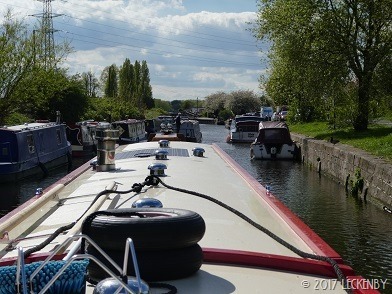 Whilst Mick was out I had a tidy, washed the port side windows and had a tinker with our blogs. As you can see NB Oleanna’s has had a bit of a make over and I suspect we’ll keep tinkering with it for a while. In a weeks time our cruising blog will only be posted on NB Oleanna’s blog, leaving NB Lillyanne’s blog behind. It will only get updated when anything significant happens to her. The build of NB Oleanna will be moved to a blog specifically to do with the build, which apart from a few snagging bits and bobs, oh and batteries is also complete. So if you would like to continue following our travels please sign up to follow us on this blog. 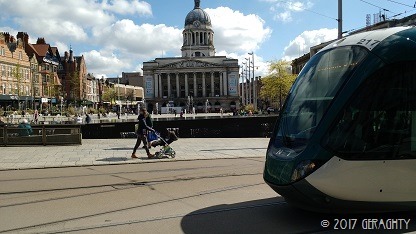 After lunch we pushed off and made our way through Nottingham towards Beeston. The last couple of miles was slow going as we had caught up a boat who seemed to like travelling on tick over, he then somehow managed to slow down even more to pass boats. We don’t travel fast by any means, but his progress was at a snails pace. We pulled in to deal with rubbish before we continued. Beeston Lock takes you back out onto the Trent and is normally only about a foot difference in water levels. Paddles are left open at both ends to let water flow through Nottingham to keep the pound to Meadow Lock constant. Back out on the river we could speed up. 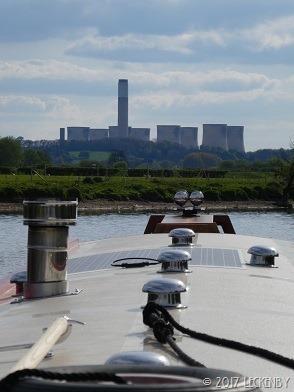 The afternoon was sunny and the Trent calm, a lovely day to be cruising. Properties along the river all seem to be summer houses with moorings. We were disappointed not to have a wave from a lady who has always been in her garden when we’ve passed, but to make up for it there was a toddler behind a large picture window who’s arms must have been falling off with the amount of waving he gave us. 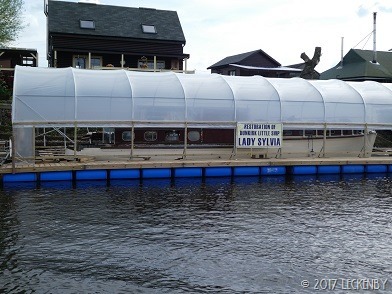 A dry dock has been created to house the restoration of a Dunkirk Boat, we did wonder if they had needed planning permission to erect such a large structure on the water. The river narrows and gets confused shortly before Cranfleet Lock, Mick doesn’t like this stretch, but soon we were by the pontoon ready to set the lock. Cranfleet is quite a deep lock and has windlasses welded onto the paddle mechanisms, the gates have long beams but are still very heavy. Mick went up to set the lock whilst I watched quite large waves going the wrong way on the river. 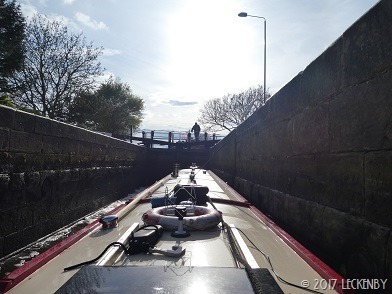 Once in the lock I passed a rope up to Mick who tied Oleanna off to a bollard, then he started to fill the lock very gradually. The paddles on the lock don’t quite do what you expect of them and even though we’ve been through here quite a few times we can never remember which is the best way to do it, or even if we’ve sussed it out yet! Signs along the cut show the proposed location of a viaduct that is proposed when HS2 comes through. The building of it will take quite some doing and the cut won’t be the same. 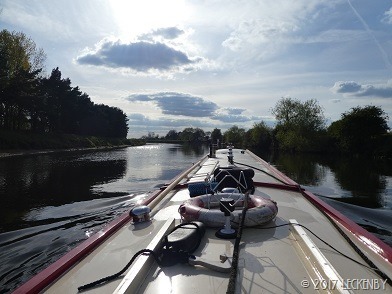 At the end of the cutting we had choices as to which way to continue, to the left and the Soar, straight on to the Trent and Mersey. 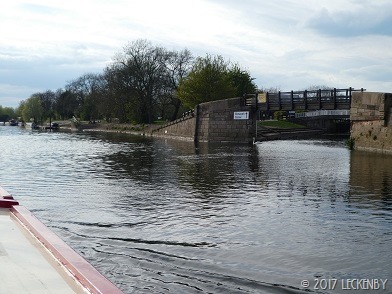 We went straight on and as there was space on Trent Lock pontoon we pulled in and moored at one of our favourite places. Tomorrow we need to find some coal as the weather forecast is for very chilly nights. 2 locks, 8.16 miles, 6 boxes of wine, 3 lots of tea, 23 litre container, 2 cheese twists! 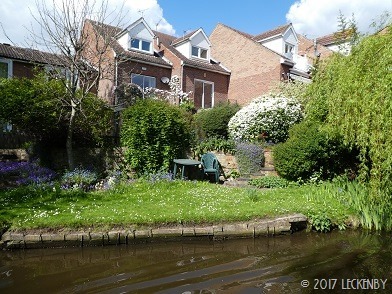 2 blogs altered, 1 side clean windows, 1 very slow boat to Beeston, 2 bin bags, 3 boats on lock landings, 1 black cat, 1 space on the outside pontoon. In a weeks time our cruising blog will only be posted on NB Oleanna’s blog and NB Lillyanne’s blog will only be updated when something significant happens. So if you would like to continue to follow our travels please click to follow Oleanna. This entry was posted in Uncategorized on 18th Apr 2017 by pipandmick.